I have been established as a florist in Newmarket for 20 years and been fortunate to work for amazing clients all over the world designing flowers for weddings, parties and corporate events. The events can range from launching cars to horse racing and designing the whole event, whatever the occasion. 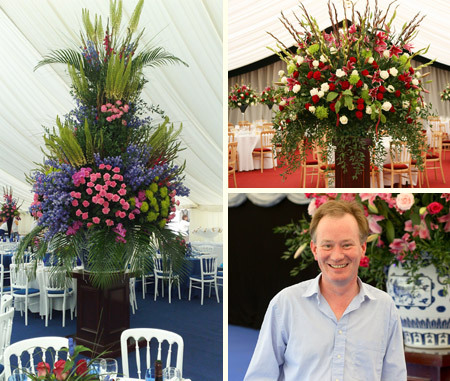 I am known for the enormity of my work, especially the 30-40 feet high freestanding flower arrangements. My Newmarket flower shop opened in February 2003. It is very indulgent with all things flower orientated from all a round the world sourced by myself. Wedding flowers are a core part of the business and nothing gives us greater pleasure than a bride seeing the church and reception when we have finished, no matter what her budget has been it is our job to make the day unforgettable. We very much look forward to playing a part in making your wedding a day not to forget.